Get a taste of our latest crunchy blog post below. Pork Rind Nachos: Add a tasty twist to a traditional nacho recipe by swapping out corn chips for Southern Recipe pork rinds. Layer on your favorite toppings for a tasty snack with some massive crunch! Jalapeno Poppers: Jalapeno poppers are a classic snack food. 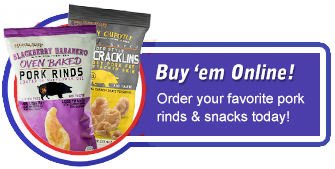 Next time you’re craving this spicy snack, go for a low carb recipe using pork rinds instead of bread crumbs. Southern Recipe Hot and Spicy pork rinds work perfectly in this snack food recipe! Pork Rinds and Queso Dip: You heard us right … pork rinds and queso. We can’t think of a better combination than Southern Recipe pork rinds and cheesy queso dip. Make this snack even more hearty by adding ground beef to your recipe! Craving more crunch? Check out our Pinterest page for a little inspiration on how to elevate your favorite snacks!